Supporters have congratulated staff and volunteers at a thriving leisure centre after it was nominated for a national award. Wrexham Council closed Plas Madoc down in 2014, but a small band of dedicated supporters worked tirelessly to reopen the much-loved facility as a social enterprise. Now the volunteer-led Splash Community Trust, which runs the centre, has been shortlisted for this year’s Social Business Wales Awards, which take place in Cardiff on September 26. 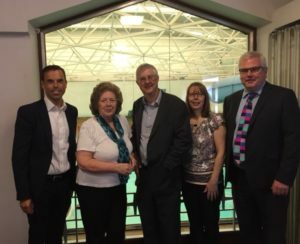 Local Assembly Member Ken Skates, who helped co-found the group, visited Plas Madoc on Saturday with fellow AM Mark Drakeford to congratulate the team in person. Mr Skates said: “Plas Madoc is an amazing local success story and I’m incredibly proud of where it is today, with improvements being made all the time and visitor numbers increasing. Splash Community Trust secretary Stella Matthews said the centre now employs more than 40 people and has become a thriving community hub. Mr Drakeford said: “Ken has told me a lot about Plas Madoc and the amazing turnaround in the past few years. I have wanted to visit for some time and it was wonderful to meet the staff and volunteers and to see the centre so busy and bustling on a Saturday morning. Subscribe to my e-newsletter to get the latest news from Clwyd South and the Assembly emailed to your inbox. Developed by ePolitixDesign. Neither the National Assembly for Wales, nor Ken Skates AM, are responsible for the content of external links or websites..